It wasn’t so long ago that scraping a flat fee off of a user’s transaction was a reliable revenue model. But with the advent of cryptocurrencies, a new wave of startups is beginning to set its sights on something different, with mainstream brands like Telegram and Kik pivoting to embrace an alternative model that wasn’t yet possible when they launched. If you’ve been confused about the announcements, there’s a simple idea close to the center – namely, that companies in question could use cryptocurrencies to distribute revenue in a more equitable way, using a digital asset that behaves like bitcoin or ether in that it gives users an actual, tradeable stake in a platform’s growth. It works like this: companies issue a certain number of crypto tokens (keeping a percentage for themselves) to be used on a platform now or in the future. If users see value in the platform, they’ll purchase the tokens needed to interact with that platform. Yet, since the amount of crypto tokens is limited, supply and demand pushes the value of the token up (or down). And as the company holds a reserve of the tokens, the value of that reserve fluctuates as well. Effectively sales revenue is being replaced with asset appreciation, with payroll covered through the early years with proceeds from the coin “offering.” But, as announcements have shown, you don’t exactly have to be a new company to get involved. After selling $24 million worth of its ethereum-based token in December, YouNow CEO Adi Sideman is already reporting that its revenue strategy has changed. And industry experts like Mason Borda, CEO and co-founder of token sale management company TokenSoft Inc, believe this trend will continue. “The more ethically pure way to look at this is the company will be rewarded because their metrics will go up because they will have been able to drive user engagement,” he said. Yet, not every company will benefit from or be able to execute on the switch to a revenue model that relies on crypto. YouNow, for example, has a head start in making the transition – it’s had a traditional virtual currency, called “bars,” on the platform for years now. And according to YouNow, users spend an equivalent of $24 million on bars every year, buying virtual gifts such as super-likes and digital stickers that they can shower videos and content creators they enjoy with. There’s also a reputation mechanism on YouNow. While bars can be purchased outright to buy digital gifts, when a content creator receives digital gifts, their clout on the network increases. And YouNow shares the money spent on purchases of digital gifts on a broadcaster’s channel with the creator. Rize evolves the user experience from one where viewers just watch content creators to one where viewers are also part of the experience (their cameras will also be streaming, so that content creators can see their reactions). 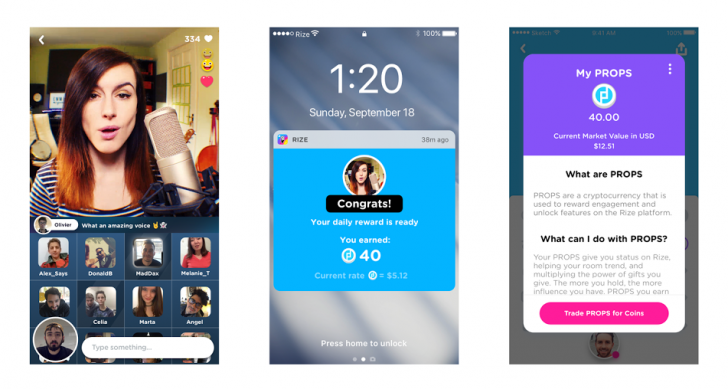 Users will buy coins to purchase digital gifts within the platform, but they’ll earn the cryptocurrency props for engaging content. “I would call it a move toward more participation,” said Sideman. And that engagement should increase the number of digital gifts sent, and in turn, garner revenue for the company, not just in bars sales, but in new users interested in trading props, of which the company kept 30 percent of the 1 billion tokens issued. In this way, YouNow has shifted away from a company maximizing returns on person-to-person payments to one interested in building new products and services into the platform to entice more users in an effort to see the value of props rise. And Borda argued that systems like YouNow’s, that reward users for participating in the ecosystem, should work well. Using the example of frequent flier miles, he argued that consumers are already familiar with these kinds of rewards. 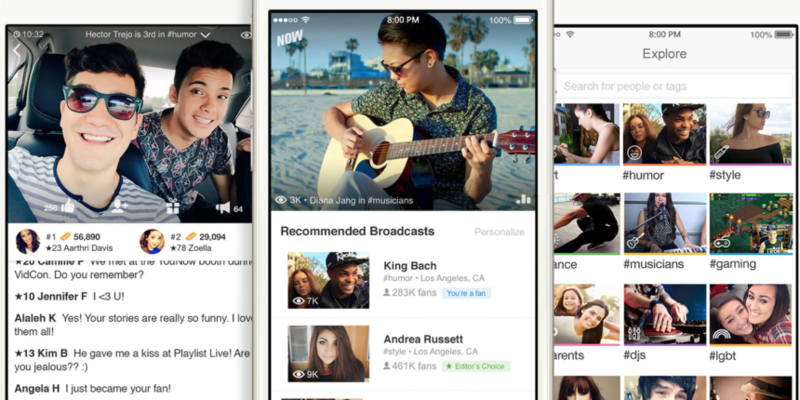 While YouNow isn’t decentralizing its whole architecture right away, it is working toward that, outlining its bigger ambitions in a Medium post. Up next, new apps will come out using the same underlying video infrastructure as Rize and allowing users to hop over without the need to rebuild their social graph. But because there is still a traditional virtual currency that users buy from the company, YouNow is still relying on taking cuts off payments in some ways. Sideman admits this, but he also told CoinDesk that with the move towards crypto tokens, fundamentally the YouNow business model is based on growing the value of props. A recent Wired article, which mentioned YouNow, called ICOs a new lifeline for stalled or failing startups. And speaking to CoinDesk, Arianna Simpson, founder and managing partner of crypto hedge fund Autonomous Partners, echoed that sentiment. Plus, she continued, it’s not clear yet whether redistributing a significant amount of revenue around the community will be beneficial to companies at large. According to Simpson, many ICO issuers are just taking advantage of an unskeptical market that will buy any pitch. A large portion of the current market likely intends to speculate on the new tokens rather than buying them to use on the new platforms, for instance. Although, Kik recently published a report on the beta test of its new crypto token with the app’s most engaged users, which suggested that there is interest in earning and spending crypto tokens on its platform. Yet, even YouNow’s Sideman acknowledges that the market is frothy.